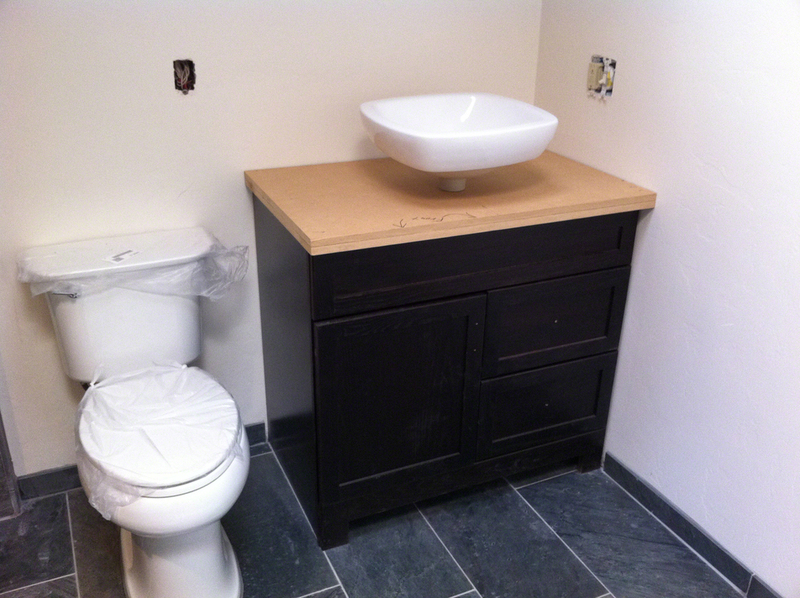 Step by step instructions on how to make your own bathroom vanity out of a sheet of TXTR-LITE Flexible Stone Veneer. 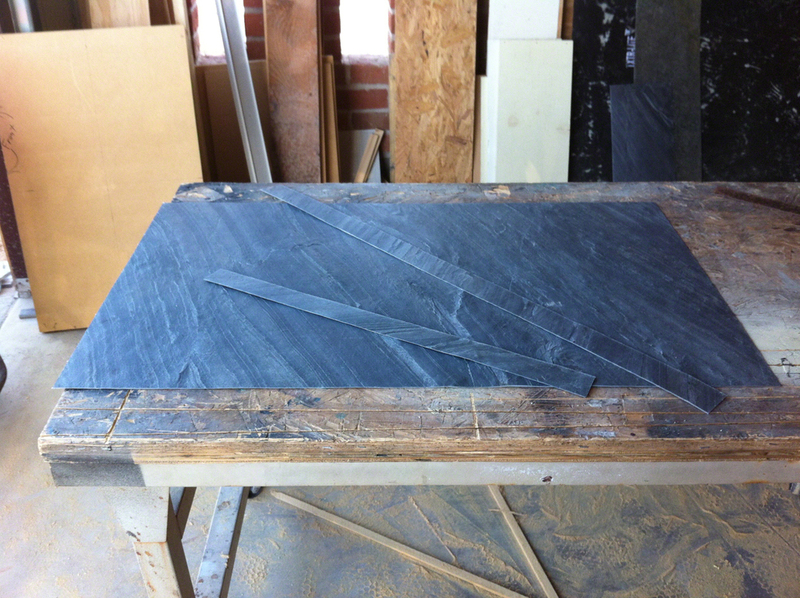 This is the sheet of Ocean Black TXTR-LITE that will be used for the top and face of the vanity. Cut and numbered for easy installation. The top piece and front strip are cut about an 1/8" long to insure a tight corner joint. Seal with Behr Low Luster sealer. This will keep the TXTR-LITE flexible stone veneer clean during install and make it easier to clean in the future. 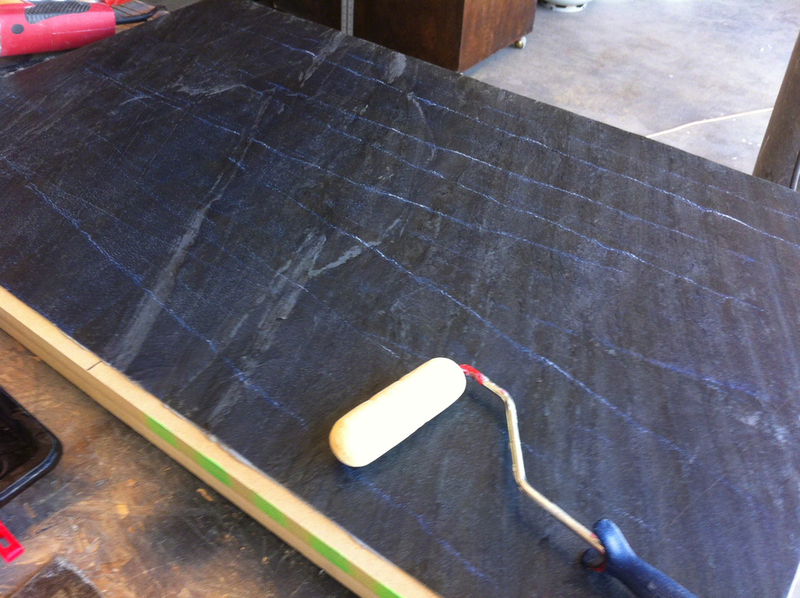 Apply the sealer after the TXTR-LITE flexible stone veneer has been cut and before it is installed. Do not let the sealer dry with air bubbles on the surface. 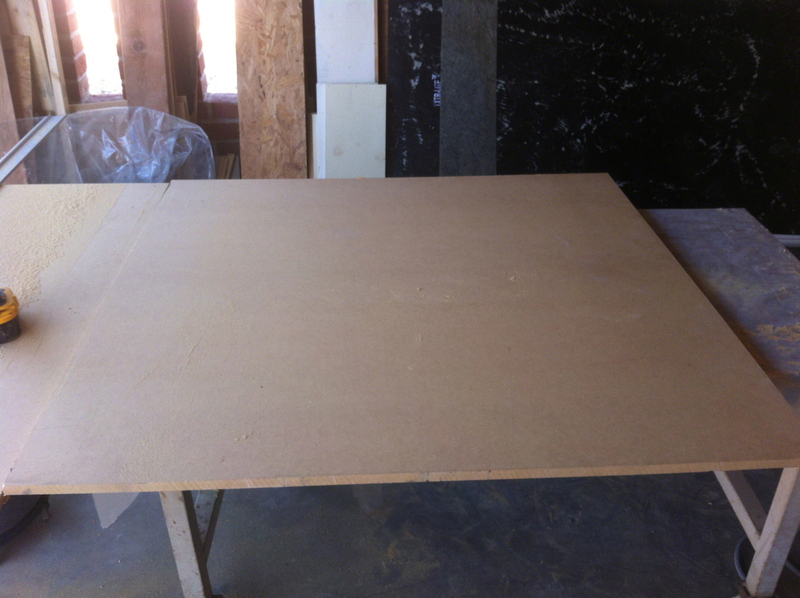 This will be used for the structure of the vanity. Glued and brad nailed to edge to add depth. 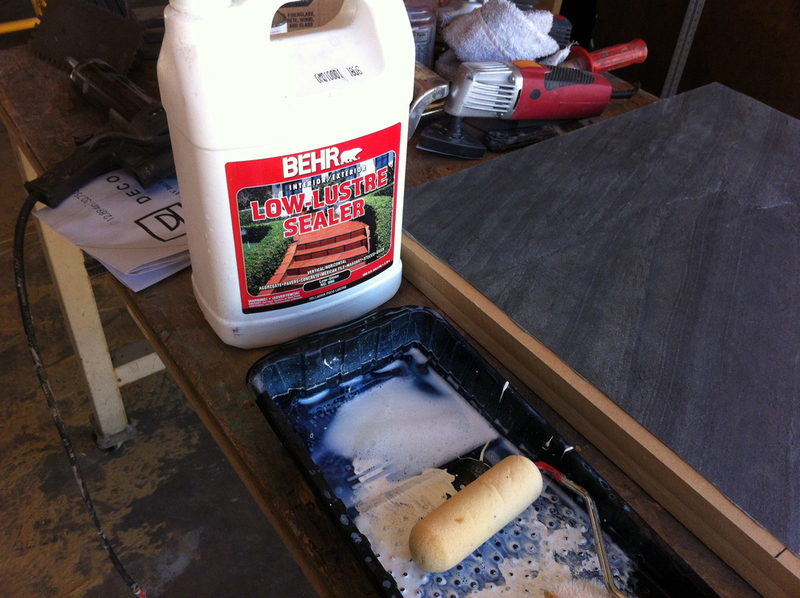 Apply the TL Adhesive using a 3/16" V-notch trowel. 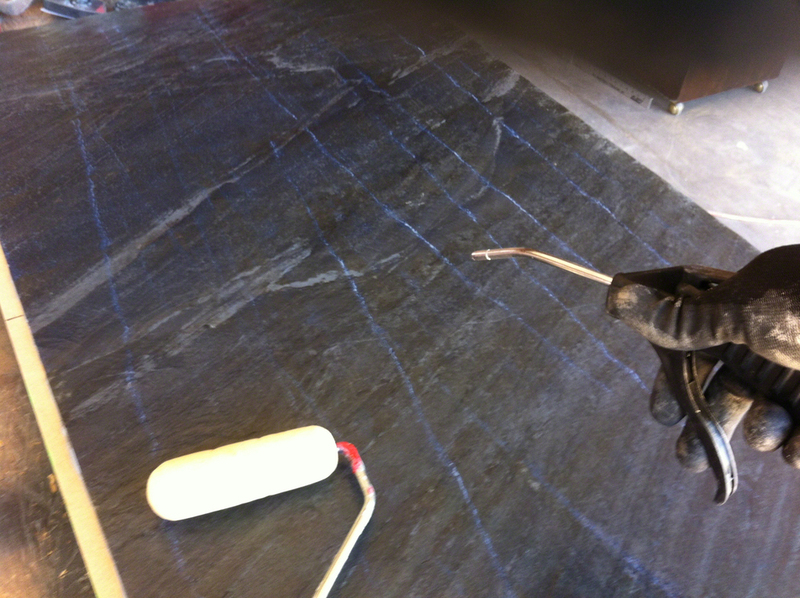 Staring from the center and working out, use a hand-roller to laminate the TXTR-LITE flexible stone veneer to the MDF. Working from the center out will remove any airbubbles. The masking tape protects the side strips from getting any adhesive on them during install. Apple TL Adhesive on the side strips using the same technique. Note the masking tape protects the surface of the strip and keeps the adhesive off the surface of the strip. A little bit of adhesive being pushed out during lamination is normal. This insures that the correct amount of adhesive has been used. Lacquer thinner will clean any TL Adhesive off of the tools. The masking tape was removed after 4 hours of adhesive curing time. Adhesive curing time depends on temperature and humidity. 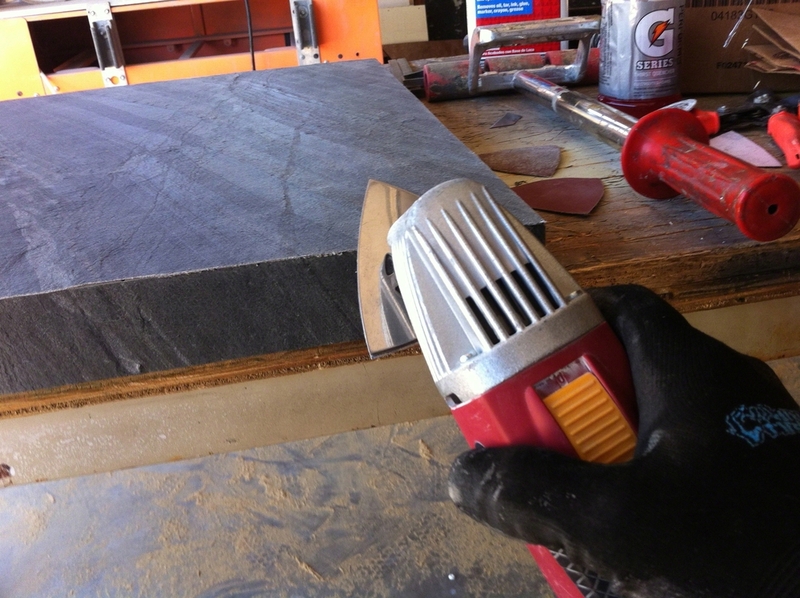 Use an electric sander to sand the edges flush. The extra 1/8" of material will insure that the finished corner is flush. Note how the grain of the TXTR-LITE flexible stone veneer follows the edge. A carbide-tipped hole saw is used to drill the hole for the faucet. A carbide-tipped hole saw is used to drill the starting hole for the sink, then a jig-saw is used to finish the cut. 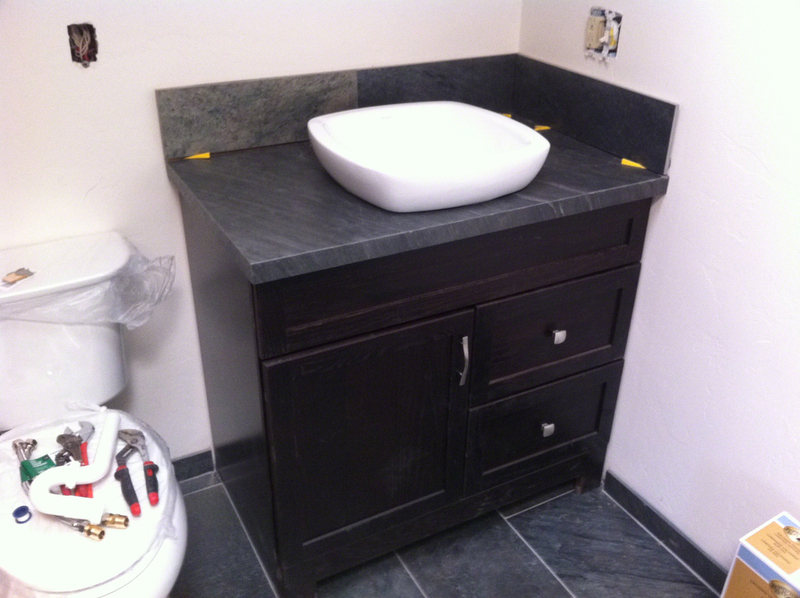 The polished stone material was used for the backslash.